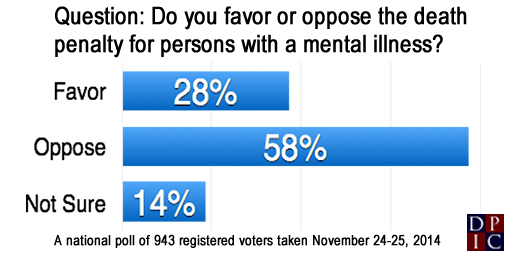 A new poll found that Americans oppose the death penalty for people with mental illness by more than a 2-1 margin. According to Public Policy Polling, 58% of respondents opposed capital punishment for people with mental illness, while only 28% supported it. Professor Robert Smith, an assistant professor of law at the University of North Carolina who commissioned the poll, said, "Today's important polling is part of significant new research which clearly shows an emerging consensus against using capital punishment in cases where the defendant is mentally ill. ... Combining this public polling, sentencing practices, and the recommendations of the mental health medical community, it's clear that a consensus is emerging against the execution of a person like Scott Panetti, who suffers from a debilitating (mental) illness ...." Opposition to the execution of people with mental illness was strong across lines of race, gender, geographic region, political affiliation, and education. Democrats (62%), Republicans (59%) and Independents (51%) all opposed the practice. The results echo the growing number of prominent leaders speaking out against the execution of Panetti in Texas, scheduled for December 3. In a Gallup poll released on October 23, support for the death penalty was 63%, remaining within the margin of error of a 40-year low of 60% last year. These results represent a dramatic shift in Americans' views on the death penalty since the 1990's, when support for the death penalty peaked at 80%. Opposition to the death penalty has grown significantly among Democrats, more than doubling over the last 20 years, from 22% in 1994 to 46% today. When offered the alternative punishment of life without parole, respondents are about evenly split, with 50% favoring the death penalty and 45% favoring life without parole. 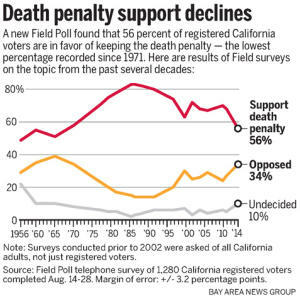 Gallup highlighted the dramatic drop in support since the 1990's, saying, "These trends toward diminished support seem to be reflected in state death penalty laws, as six U.S. states have abolished the death penalty since 2007, and no new states have adopted it." See below for a statement on the poll from DPIC's Executive Director, Richard Dieter. A recent poll of 1,600 Russians found that only 52% support the death penalty, a sharp decline from 2002, when 73% said they supported it. Two years ago, 61% were in favor of capital punishment. Russia currently has a moratorium on the death penalty that was put in place in 1996 by President Yeltsin, shortly before Russia signed a relevant protocol of the European Convention on Human Rights. Russia's high court has ruled that even death sentences cannot be handed down. Hundreds of those on death row had their sentences commuted to life. 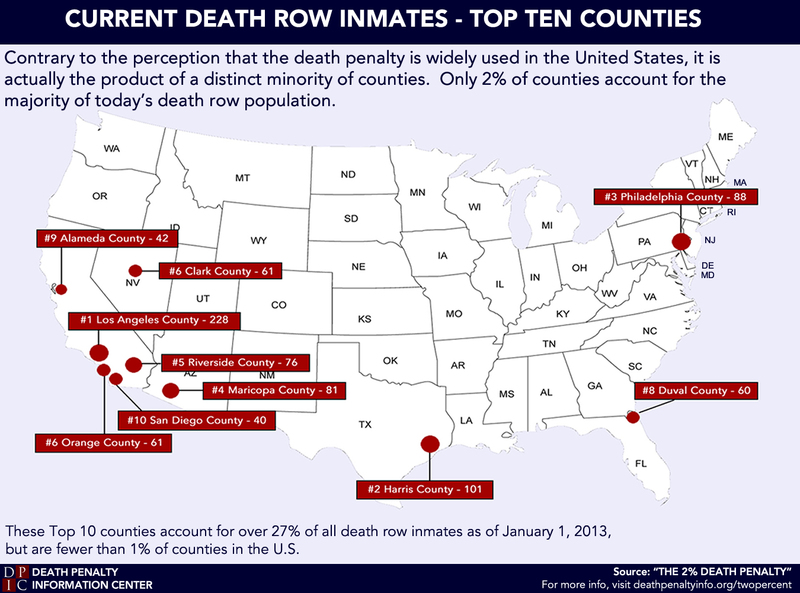 Further analysis of a recent poll by the Pew Research Center found that support for the death penalty was significantly lower among some racial and ethnic minorities than for the general population. More Hispanics oppose the death penalty (50%) than support it (40%), and the same is true of African Americans, with only about a third (36%) favoring capital punishment and a majority (55%) opposing it. Democrats are about evenly split, with 45% in favor and 47% opposed, while 71% of Republicans support it. Black Protestants and Hispanic Catholics were among those most in opposition to capital punishment (58% and 54% opposed, respectively). Support was lower among younger Americans; for those in the age group 18-29, only 51% supported the death penalty. Overall, 55% of Americans in the poll supported the death penalty, the lowest level since Pew began polling on this question in 1996. Pew said greater public awareness of wrongful convictions and lower crime rates may be partly responsible for the declining support of capital punishment. Support for the death penalty has fallen sharply by 23 percentage points since 1996, reaching its lowest level in almost two decades, according to a recent poll by the Pew Research Center. The 2013 poll also found a 10 point drop in just the last 2 years in respondents who say they "strongly favor" the death penalty, from 28% to 18%. The percentage of Americans who say they oppose the death penalty has risen to 37%. In 2011, Pew asked respondents about the reasons behind their views on the death penalty, finding that the top two reasons for opposition to capital punishment were the imperfect nature of the justice system and a belief that the death penalty is immoral. The drop in public support coincides with an overall decline in use of the death penalty during the same time period, with both death sentences and executions falling dramatically since the 1990s. Six states have repealed the death penalty in the last six years, and three governors have recently imposed moratoriums on executions.